Learning how to crochet can be so fun and easy, especially when you have someone to help you walk through a project or technique. When I was first trying to learn, I really wanted to find some step by step instructions to get me started –a walk-through, beginning to end. It was really hard to find, though, and that was so frustrating to me. So, that’s what I want to offer you here. You’ll find super easy projects with how-to instructions from start to finish. I’ve included lots of pictures so you can see how each step should look. That way you will have something to compare your work to. You won’t have to wonder if you’re doing it right. You’ll be able to see for yourself. Pick and choose which ones you want to do. 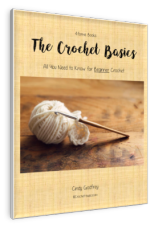 Better yet, work through all of them and get a great start to your crocheting experience. Crochet hearts are the sweetest! I kind of have an obsession with them. No matter the pattern, they look lacy and pretty and really just adorable. The best part, they're usually quick and simple to make. Crochet stars are an essential for me. I use them for my Independence Day decorations, for Halloween and for Christmas, too. I also use them to embellish some of my baby projects and afghans. They can be used to decorate jeans, purses, and hair accessories, too. 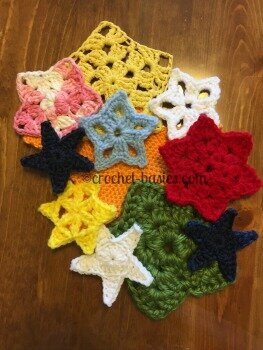 Are you starting to see just how wonderful crochet stars can be? Check them out here. Learning to crochet in rounds is an absolute must! So, let's start with something really easy and that every crocheter should know, Foundation Rings. Every project crocheted in rounds starts with a foundation ring. There are several main ones to know, a chain ring, a yarn ring or a magic ring. If you need help with any of these (or just want to refresh your memory) here’s the how-to on foundations rings. 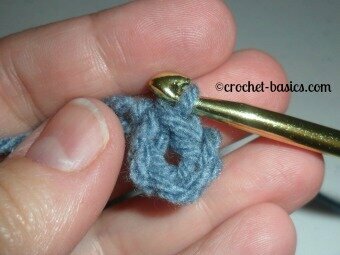 Now you’re ready for the walk-through on How To Crochet a Circle. So many patterns are crocheted in rounds. You’ll definitely want to master this skill. Want a little extra practice with rounds before starting a bigger project? 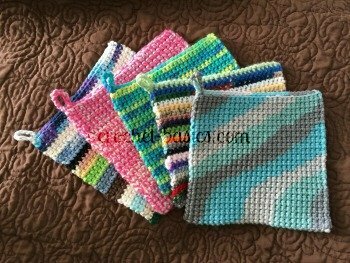 Here’s another easy pattern for a Crochet Coaster which will also give you practice changing colors. Granny Squares are so much fun. You can change the look of them just by using different colors of yarn or arranging the colors in different ways. You can also use them to make pretty much anything, from blankets to purses and everything in-between. Be careful –you might find them addictive. I know I do! Crochet granny triangles are just as much fun as the granny squares that inspired them. This fun variation gives a new twist to a familiar and comforting style. Enjoy! Crochet granny hexagons are yet another fun way to work the granny square technique. These look so beautiful in afghans, too. Crochet flowers are wonderful and so easy to make. They have a soft frilly look to them that adds a little extra flair to just about anything. This is where you learn How to Crochet a Flower. Every flower needs some leaves, right! They make great decorations or motifs for just about any time of year. 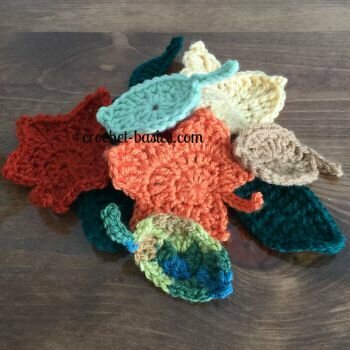 Learn how to make a beautiful Crochet Leaf or two or a handful. Who doesn't love a great pair of warm cozy socks? They're easier than you think! Plus, they’ll not only be snugly for you, they’ll make great gifts, too. 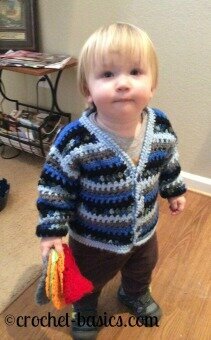 Learn How to Crochet Socks here. 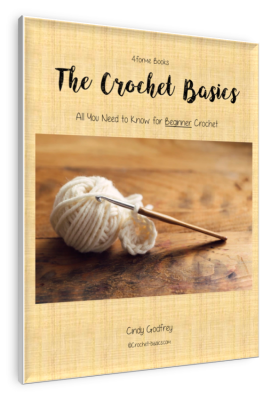 Enjoy crocheting your first projects. Remember you can always go back and repeat one of the walk-throughs and make it completely different. Just try it with a different kind of yarn or even just changing the color can be fun. Don’t be afraid to try new things!